A libertarian-leaning group is suing Seattle, saying its democracy vouchers program is unconstitutional. 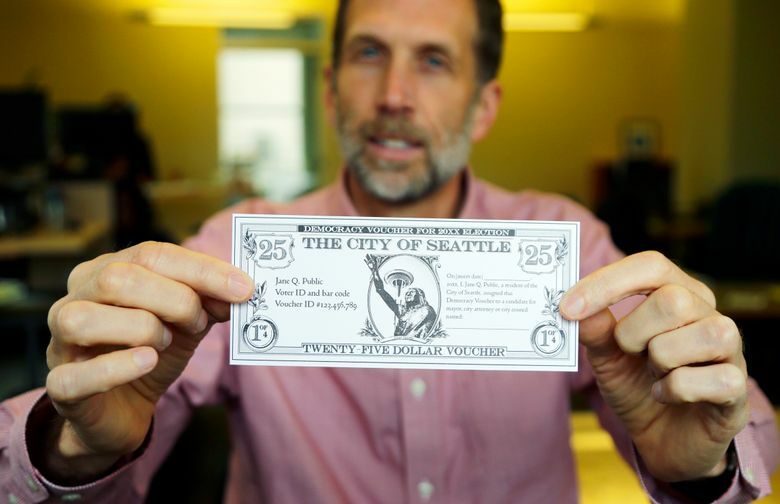 Seattle’s first-in-the-nation voucher system for publicly financing political campaigns is facing a new legal challenge by two local property owners who say it forces them to support candidates they don’t like. The Pacific Legal Foundation, a libertarian-leaning law firm, sued the city Wednesday in King County Superior Court over the “democracy voucher” program, which was passed by voters in 2015 and is being used for the first time in this year’s City Council and city attorney races. Under the program, Seattle’s voters decided to tax themselves $3 million a year in exchange for four $25 vouchers that they can sign over to candidates. According to the city, it costs the average homeowner $11.50 per year. Supporters say it’s a novel way to counter big money in politics, to engage people who wouldn’t otherwise be involved in campaigns and to help lesser-known candidates communicate their views. But the lawsuit, brought on behalf of architect Mark Elster and landlord Sarah Pynchon, claims using their tax dollars to provide vouchers to their fellow citizens, who can then use them to support candidates Elster and Pynchon oppose, violates their free-speech rights under the U.S. Constitution. Alan Durning, who helped write the voucher law, called that argument meritless. The U.S. Supreme Court has generally upheld the public financing of campaigns, within the limits of the First Amendment, saying that “public financing as a means of eliminating the improper influence of large private contributions furthers a significant governmental interest” — helping to eliminate corruption. Under the complaint’s rationale, virtually any public financing of campaigns that relies on tax revenue would be impermissible. The lawsuit does not seek an immediate court order that would block the use of the vouchers this year; Pacific Legal Foundation attorney Ethan Blevins said that was a strategic move to give the court time to weigh the case, rather than rush a decision. Adav Noti, a lawyer with the Washington, D.C.-based Campaign Legal Center, which supported Seattle’s law, said he didn’t know offhand of any other lawsuit that has challenged public campaign financing on grounds that it compels speech. He called the arguments weak, noting that people typically can’t sue over how the government chooses to spend their taxes and drawing an analogy to the current White House press secretary. “Could somebody bring a lawsuit saying, ‘I don’t want to subsidize Sean Spicer’s salary because I don’t like his speech?’” Noti asked. So far two City Council candidates — Teresa Mosqueda and Jon Grant in the Position 8 race — and City Attorney Pete Holmes have qualified to accept the vouchers by collecting threshold numbers of small-dollar contributions. Grant has redeemed the most, nearly $130,000 worth. That particularly irks Elster, who opposes Grant’s call for tenants to have more control over what they pay in rent. He spoke with reporters Wednesday at his 2,850-square-foot Seattle home, which is assessed at $865,000, according to county records. While he said he is upset about his taxes going up, his concern with the vouchers is philosophical, not financial.